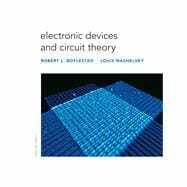 Electronic Devices and Circuit Theory, Eleventh Edition,offers a complete, comprehensive survey, focusing on all the essentials you will need to succeed on the job. Setting the standard for nearly 30 years, this highly accurate text is supported by strong pedagogy and content that is ideal for new students of this rapidly changing field. The colorful layout with ample photographs and examples helps you better understand important topics. This text is an excellent reference work for anyone involved with electronic devices and other circuitry applications, such as electrical and technical engineers. 9. BJT and JFET Frequency Response. 14. Feedback and Oscillator Circuits. 15. Power Supplies (Voltage Regulators). 17. pnpn and Other Devices.